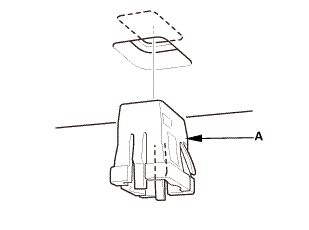 Turn the ceiling light switch OFF. 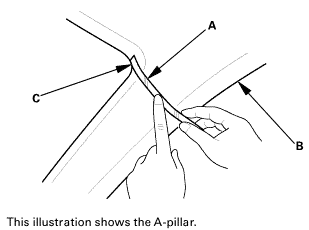 Carefully pry off the lens (A). 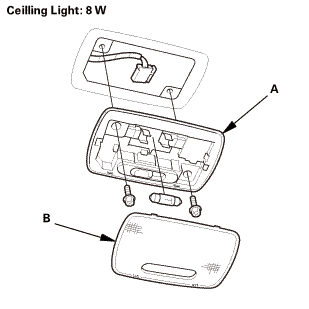 Remove the ceiling light (B). 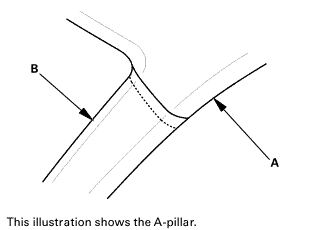 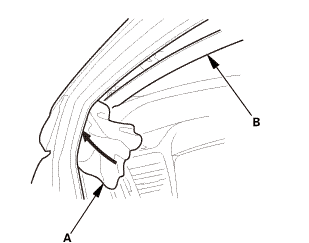 Remove the bottom area of the B-pillar upper trim (A). 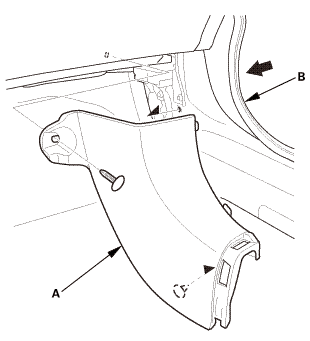 Remove the upper area of the B-pillar upper trim (A). 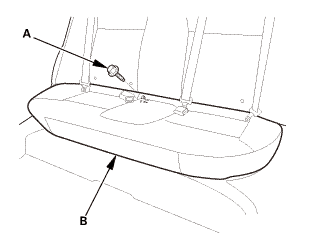 Pass the front seat belt lower anchor (A) out through the hole in the slider (B), then remove the B-pillar upper trim (C). 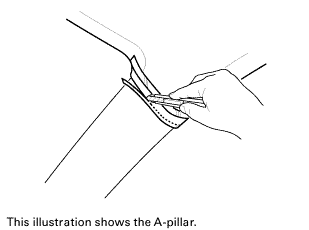 Lower the grab handle (A). 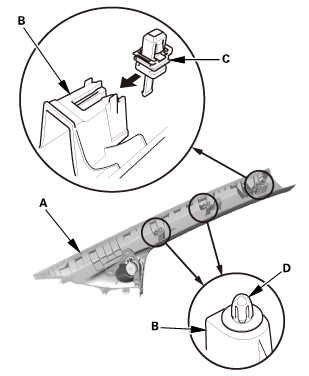 Insert the tips of the push pin/grab rail cap pliers (B) into the notch. 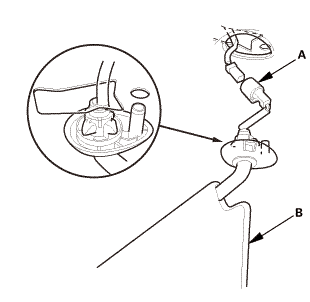 Gently squeeze the handles of the push pin/grab rail cap pliers (A), and pull the cap (B) straight out. 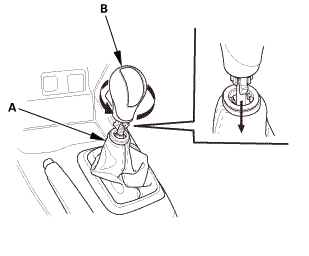 Remove the grab handle (A). 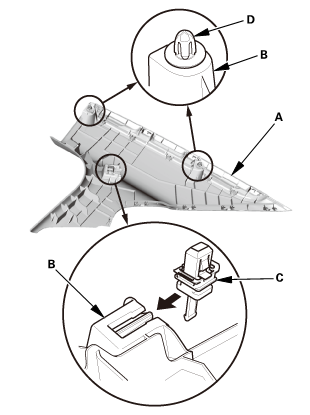 Push the hook (A) with a flat-tip screwdriver through the hole in the front side of the bracket cover (B). 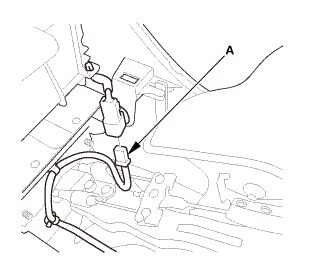 NOTE: Make sure the hook is unlocked. 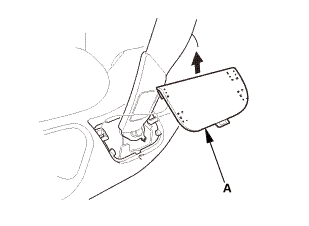 While pushing in the hook (A) with a flat-tip screwdriver, release the sunvisor (B) from the holder (C), and rotate the sunvisor backward 45 °. 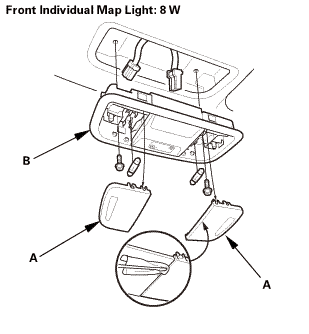 NOTE: Make sure the hook slides into the bracket cover as you rotate the sunvisor. 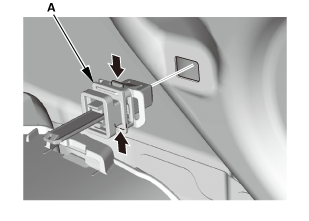 Disconnect the connector (A), then remove the sunvisor (B). 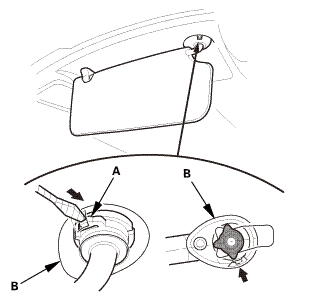 NOTE: If the sunvisor cannot be removed, the hook has not rotated into the bracket cover. 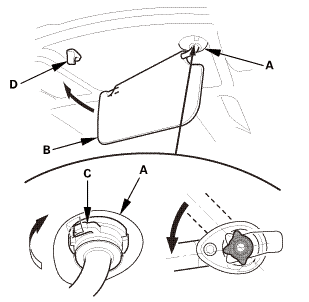 Repeat step 2 to rotate the hook. 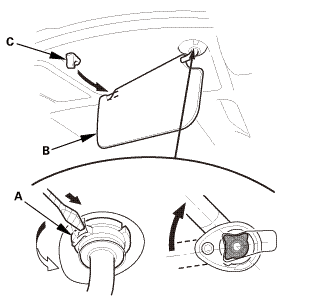 If necessary, turn the sunvisor holder (A) 45 ° counterclockwise, then remove it from the holder grommet (B). 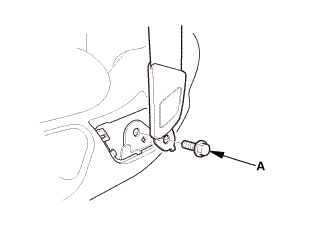 If necessary, remove the holder grommet (A). 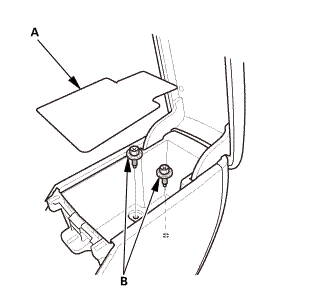 M/T: Remove the center console bracket (A). 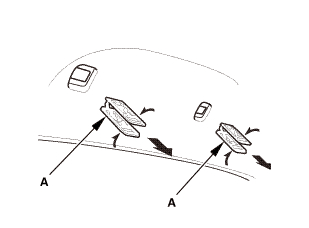 Without moonroof: From the driver's A-pillar, detach the harness clips (A). 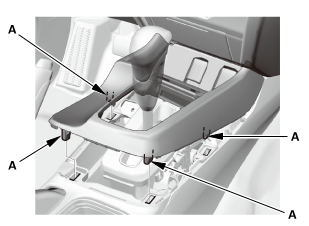 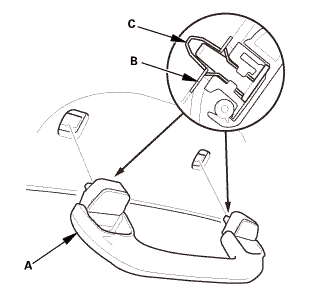 Without moonroof: From under the driver's dash, disconnect the connector (A), and detach the harness clips (B). 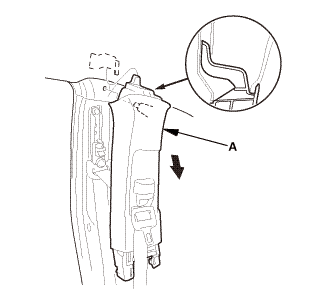 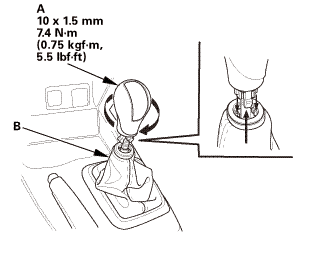 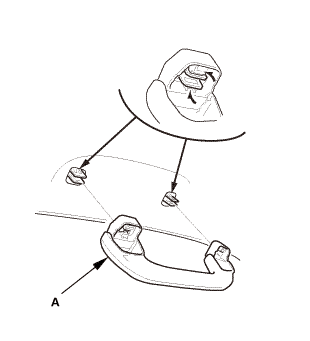 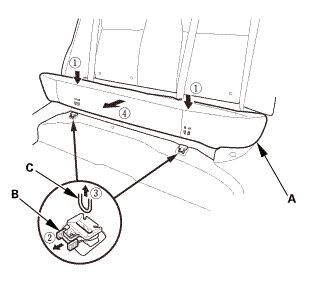 From the passenger's A-pillar, disconnect the connector (A), and detach the harness clips (B). 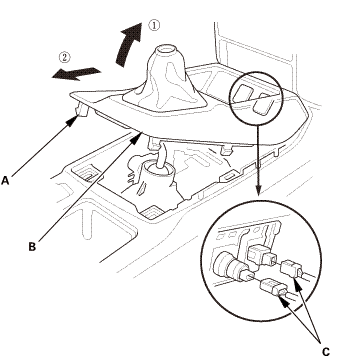 For some models: Release the glove box stops (A) on each side of the dashboard. 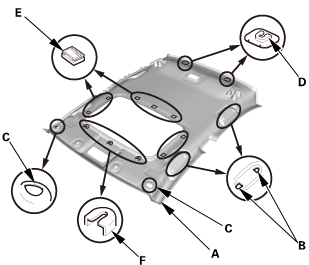 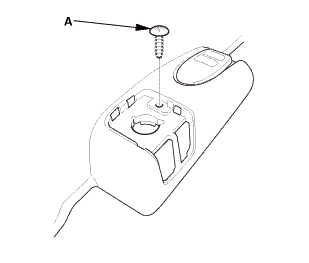 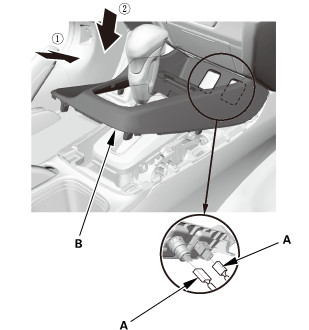 For some models: From the glove box opening, disconnect the connector (A), and detach the harness clip (B). 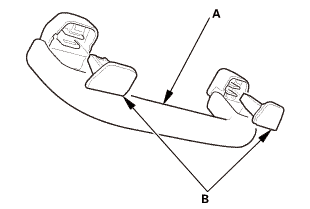 From the right C-pillar, disconnect the connector (A), and detach the harness clip (B). 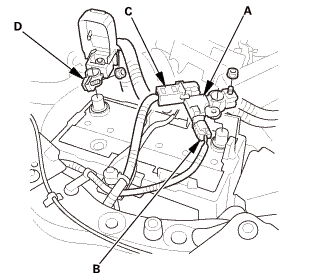 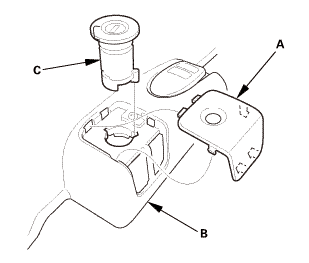 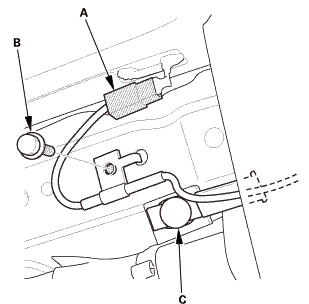 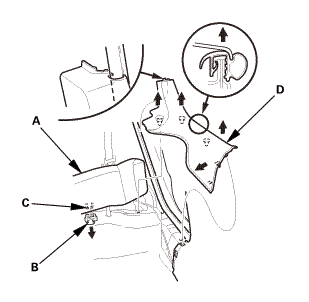 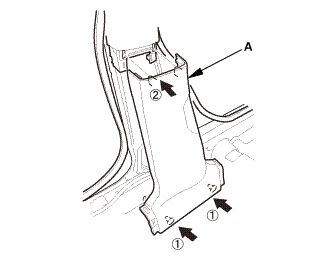 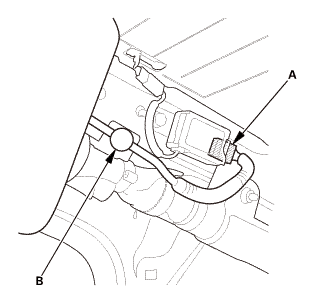 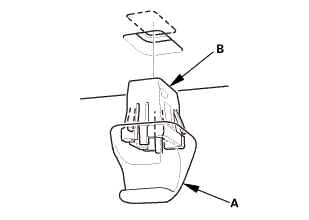 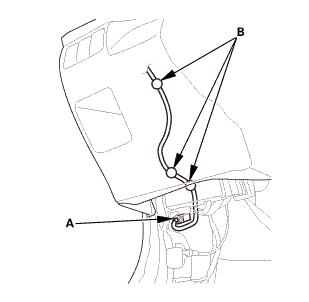 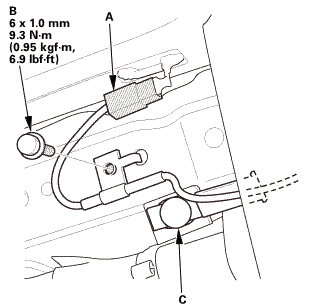 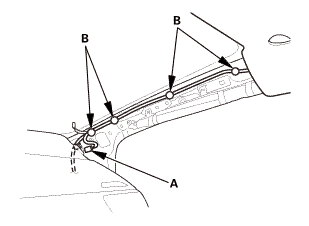 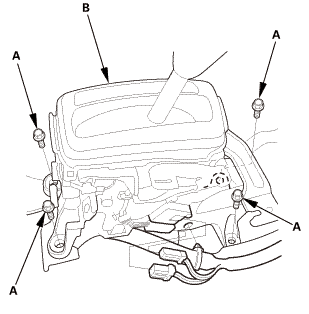 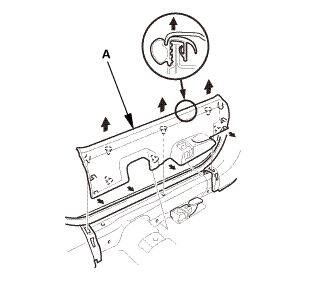 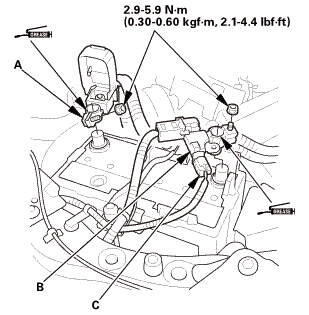 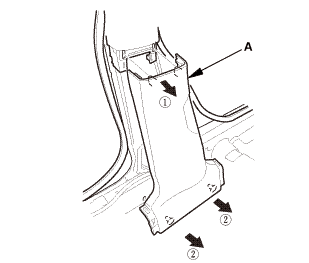 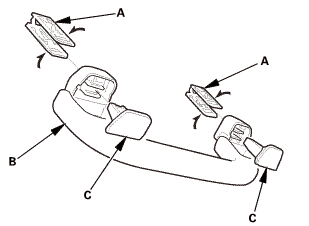 From the left C-pillar, disconnect the terminal (A), and remove the bolt (B), then detach the harness clip (C). 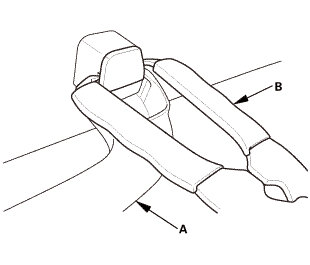 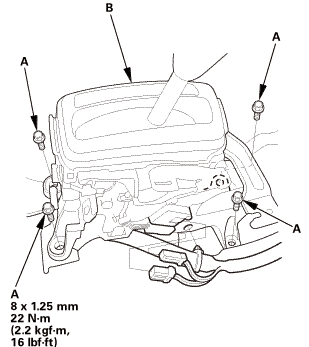 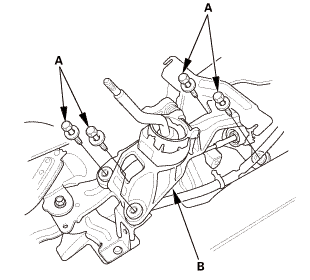 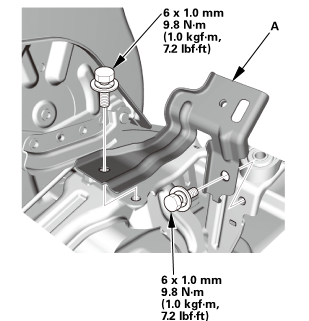 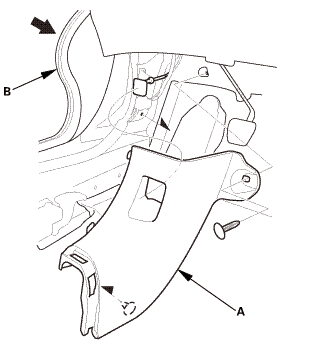 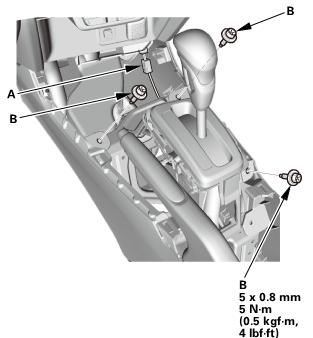 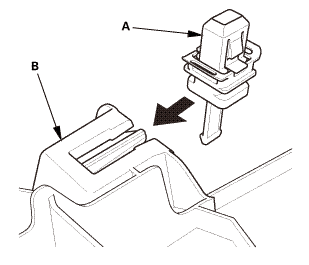 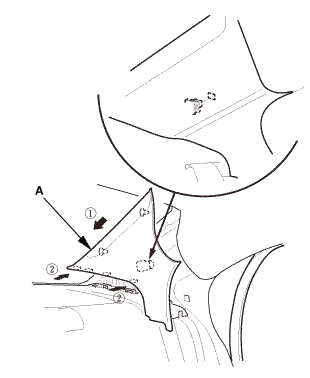 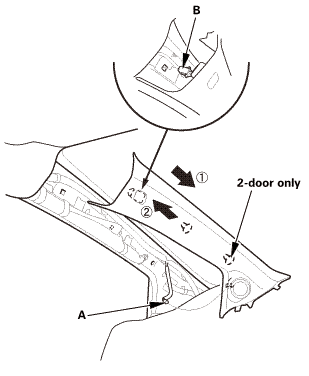 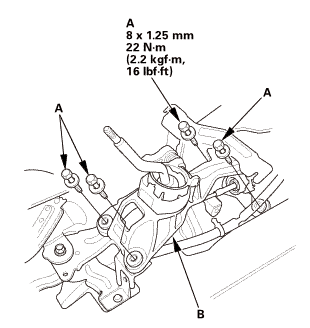 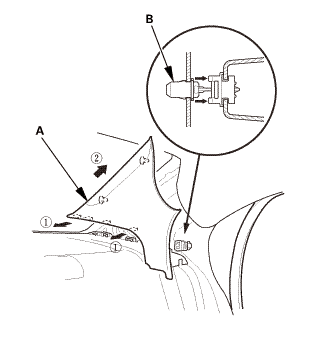 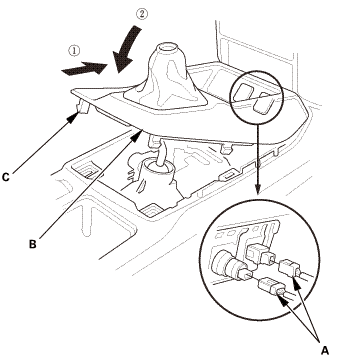 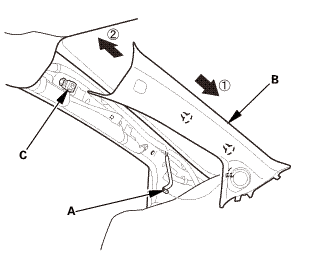 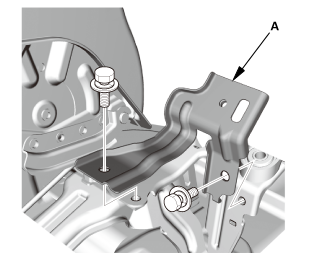 Remove the bolts (A) securing the shift lever assembly (B). 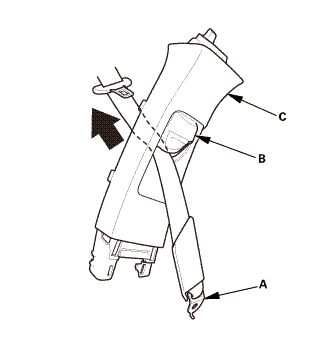 Lay the shift lever assembly down as needed. 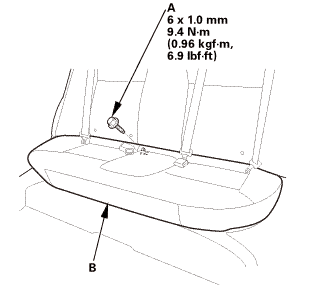 Slide the front seat all the way back, and recline the seat-back fully. 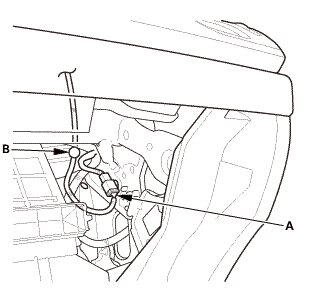 With the help of an assistant, lower the headliner (A). 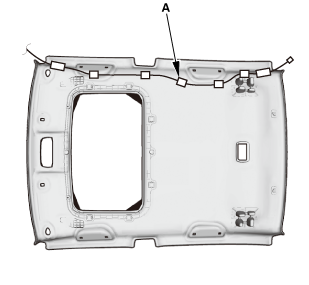 With the help of an assistant, remove the headliner (A) through the passenger's front door opening. 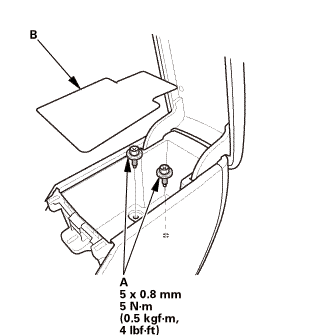 NOTE: Do not bend the headliner. 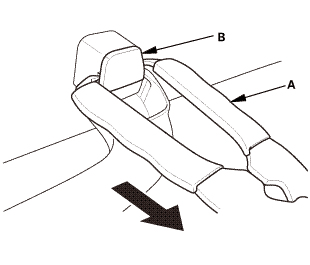 Bending the headliner will crease and damage it. If necessary, remove the cushion tapes (A). 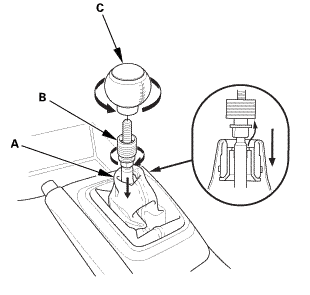 If necessary, remove the grab handle bracket (A). 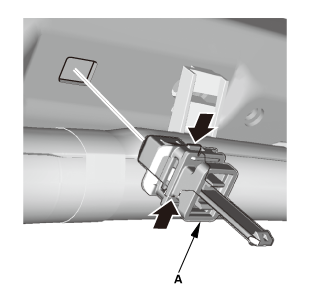 If necessary, install the grab handle bracket (A). 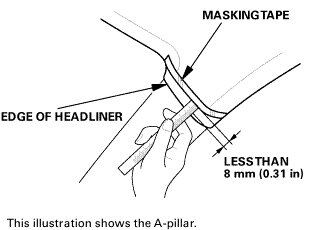 If necessary, install the cushion tapes (A). 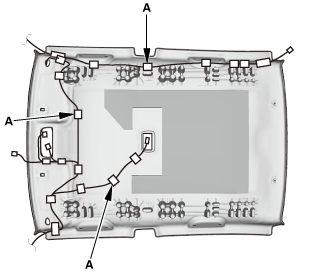 If the side curtain airbag has deployed, replace the headliner and removed trim pieces, along with the other parts listed for side curtain airbag deployment. 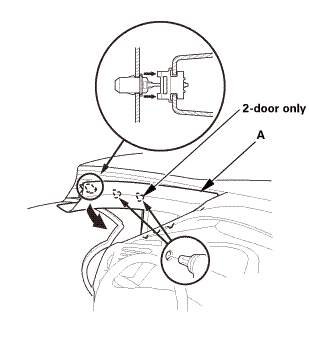 With the help of an assistant, take the headliner (A) in through the passenger's front door opening. With the help of an assistant, install the headliner (A). 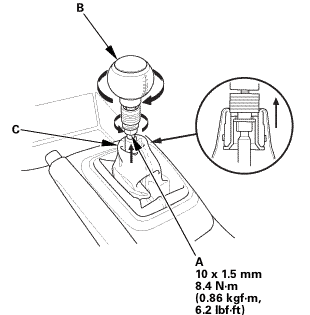 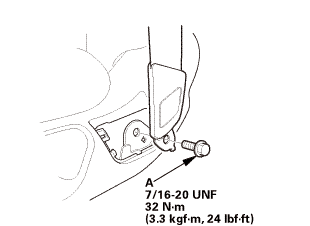 Install the bolts (A) securing the shift lever assembly (B). 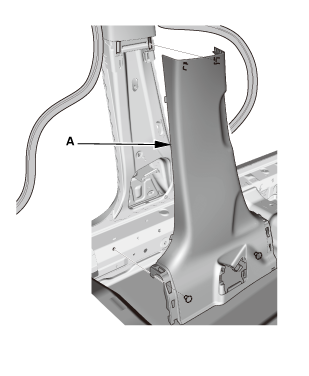 At the left C-pillar, connect the terminal (A), and install the bolt (B), then install the harness clip (C). 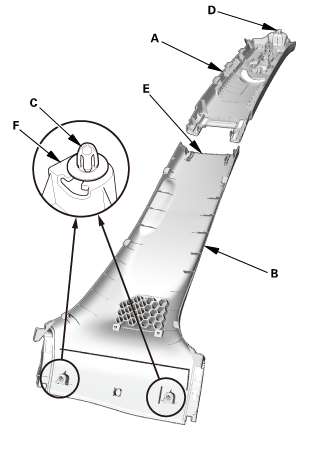 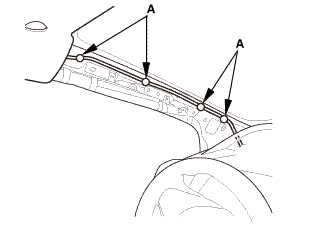 At the right C-pillar, connect the connector (A), and install the harness clip (B). 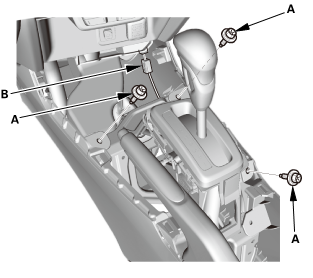 For some models: At the glove box opening, connect the connector (A), and install the harness clip (B). 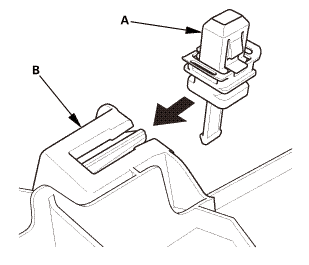 For some models: Install the glove box stops (A) on each side of the dashboard. 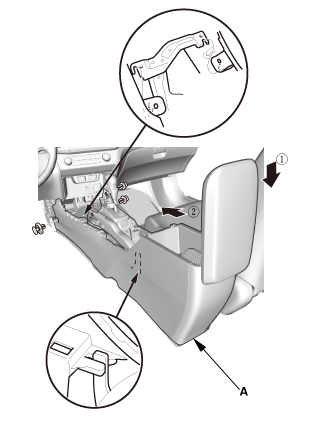 At the passenger's A-pillar, connect the connector (A), and install the harness clips (B). 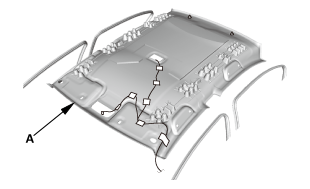 Without moonroof: Under the driver's dash, connect the connector (A), and install the harness clips (B). 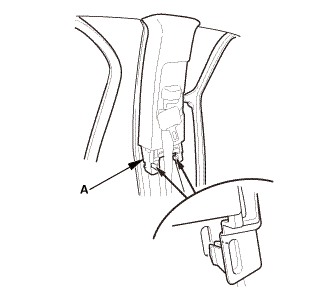 Without moonroof: At the driver's A-pillar, install the harness clips (A). 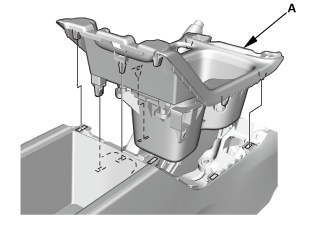 M/T: Install the center console bracket (A). 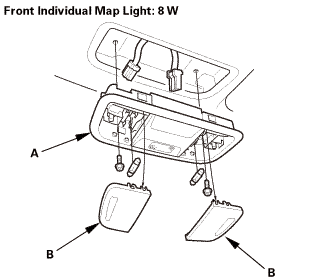 Install the front individual map light (A). 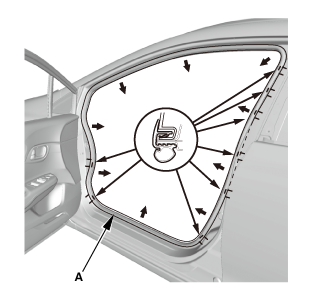 If the side curtain airbag has deployed, replace the sunvisor, along with the other parts listed for side curtain airbag deployment. 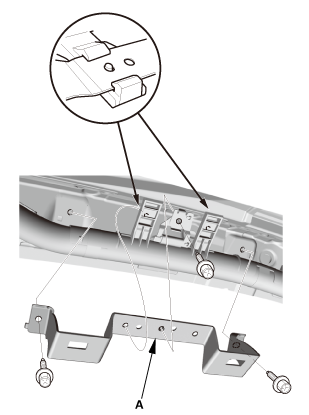 If the holder grommet is damaged or stress-whitened, replace the holder grommet and the holder as an assembly. 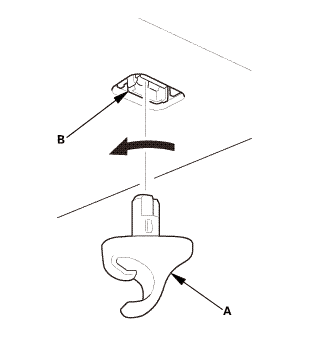 Install the holder (A) into the holder grommet (B) by turning it 45 ° clockwise. 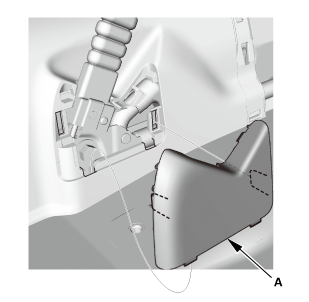 Install the holder and holder grommet as an assembly into the body by pushing it until the hooks snap into place securely. 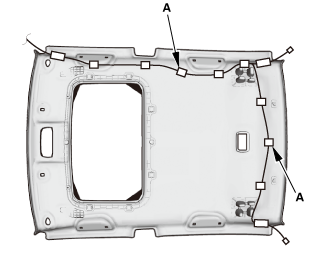 Connect the connector (A), and install the sunvisor (B). 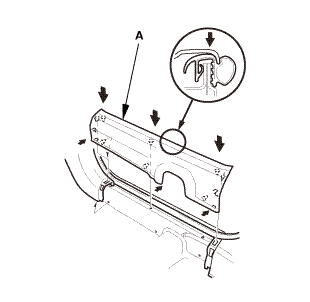 While holding the bracket cover (A), rotate the sunvisor (B) forward until the hook (C) snaps into place. 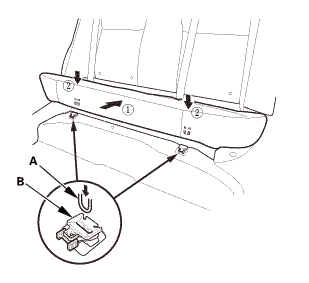 Gently pull down on the sunvisor to make sure it is properly secured in the body. 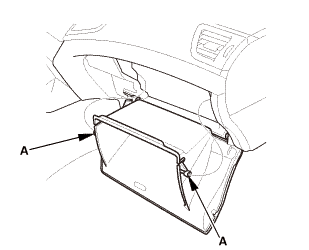 Rotate the sunvisor into the holder (D). 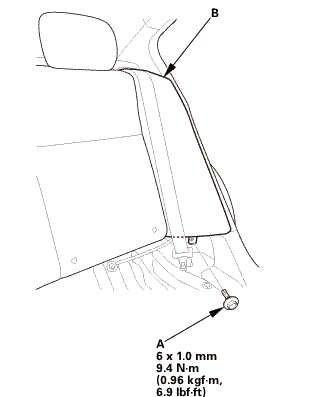 Install the clips (A) on the grab handle (B). 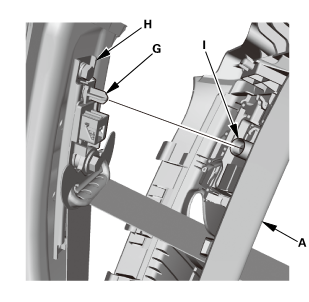 Install the caps (C) fully into the clips. 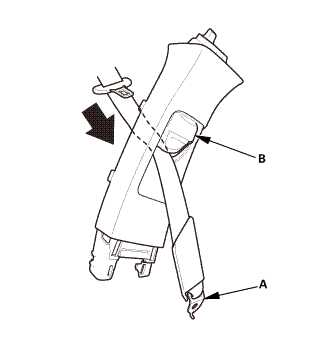 Position the grab handle (A) on the grab handle bracket (B). Push on the grab handle until the clips (C) snap into place securely. 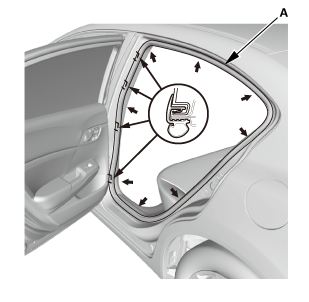 If the side curtain airbag has deployed, replace the B-pillar upper trim (A), the B-pillar lower trim (B), and all clips (C) on the trim with new parts. 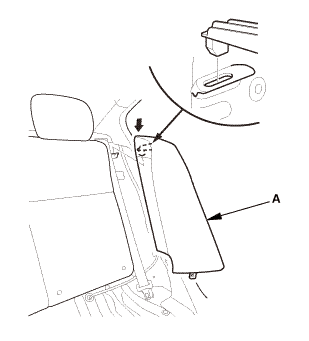 Make sure the pin (G) on the front seat belt shoulder anchor adjuster (H) and the hole (I) on the back of the slider are engaged when installing the B-pillar upper trim. 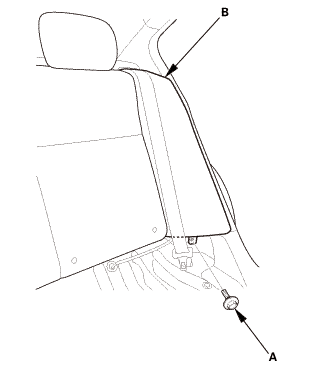 Pass the front seat belt lower anchor (A) in through the hole in the slider (B). 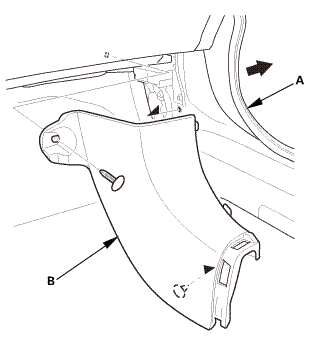 Install the upper area of the B-pillar upper trim (A). 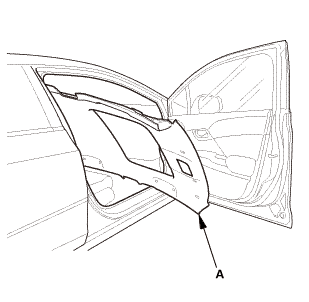 Install the bottom area of the B-pillar upper trim (A). Install the ceiling light (A). 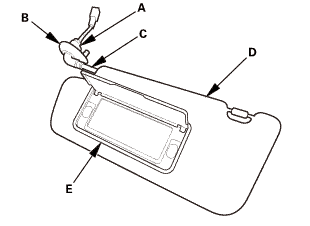 Carefully install the lens (B). 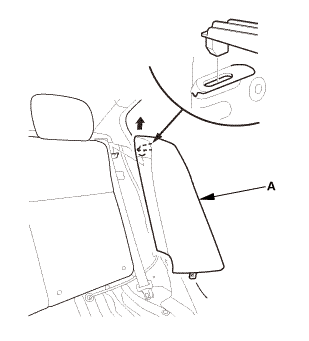 If the side curtain airbag has deployed, replace the A-pillar trim (A) and all clips on the trim with new parts. 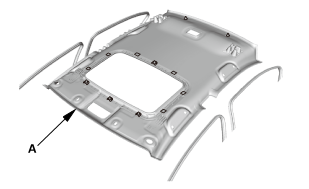 After checking and adjusting the overlap between the headliner and the A-pillar trim, replace the upper clip (C) with a new one.